During the past century, some US revenue stamps have been created by government departments for rather obscure purposes. Unlike the Federal Hunting Permit revenue stamps, these more obscure recreation fee stamps were not widely used, and they have been largely unknown to many general US stamp collectors. Not surprisingly, many of these stamps have become prized philatelic treasures to revenue stamp specialists today. This page will review the Scott-catalog-listed recreation fee or license stamps, in particular, Boating License Stamps, Camping Stamps, and Trailer Permit Stamps. 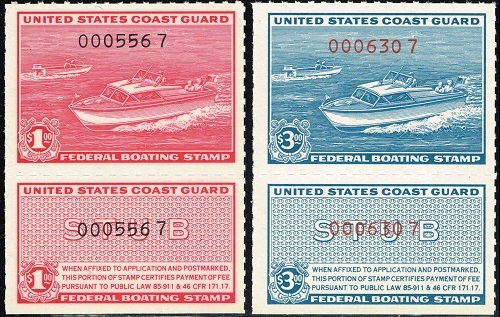 The two Federal Boating License stamps shown above were issued on April 1, 1960. The common design of the top portion features inboard and outboard motorboats. The stamps were issued pursuant to the Boating Act of 1958 and were used in the twelve states that had not yet passed laws conforming with the Boating Act. Beginning on April 1, 1960, they were required on applications for boating licenses for boats with motors exceeding ten horsepower. The upper part of the stamp was attached to a temporary certificate and kept by the boat owner. The lower part was affixed to the application and sent by the Post Office to the U.S. Coast Guard, which issued the permanent certificates. The $3.00 stamp (Sc. #RVB2) paid the three year license fee. The $1.00 stamp (Sc. #RVB1) paid the fee for lost or destroyed licenses. 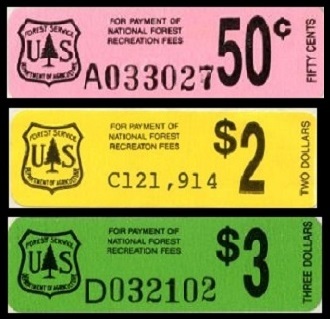 The Camping Stamp program of the Department of Agriculture National Forest Service was introduced in 1985. The public was offered the option of prepaying their recreation fees by the purchase of Camping Stamps. The fees were typically between $3.00 and $4.00. The stamps are die-cut self-adhesives on coated paper. Three examples from the 1985 issue are shown in the image above. The prefix of the serial number on each denomination corresponds with that particular denomination, as will be noted in the detail sections below. 50 C. (1985 - S/N "A" - Sc. #RVC1) - Black on Pink. 01 D. (1985 - S/N "B" - Sc. #RVC2) - Black on Red. 02 D. (1985 - S/N "C" - Sc. #RVC3) - Black on Yellow. 03 D. (1985 - S/N "D" - Sc. #RVC4) - Black on Green. 50 C. (1986 - S/N "E" - Sc. #RVC5) - Black on Pink. 01 D. (1986 - S/N "F" - Sc. #RVC6) - Black on Red. 02 D. (1986 - S/N "G" - Sc. #RVC7) - Black on Yellow. 03 D. (1986 - S/N "H" - Sc. #RVC8) - Black on Green. 05 D. (1986 - S/N "I" - Sc. #RVC9) - Black on Silver. 10 D. (1986 - S/N "J" - Sc. #RVC10) - Black on Bronze. The Camping Stamp program ended in 1988. All of the stamps on hand were destroyed by the National Forest Service. Mint examples of these US revenue stamps are very scarce. NO used examples have ever been recorded. The two Trailer Permit stamps (Sc. #RVT1-2) shown above were issued by the Department of the Interior National Park Service on July 1, 1939. The common design shows a large automobile pulling a house trailer. Beginning in July 1939, these stamps were required on motor vehicle licenses, when the vehicle was entering a national park or national monument pulling a house trailer. The use of these US revenue stamps was discontinued in 1952. Though in use for over twelve years, examples of them, both mint and used, are very scarce.